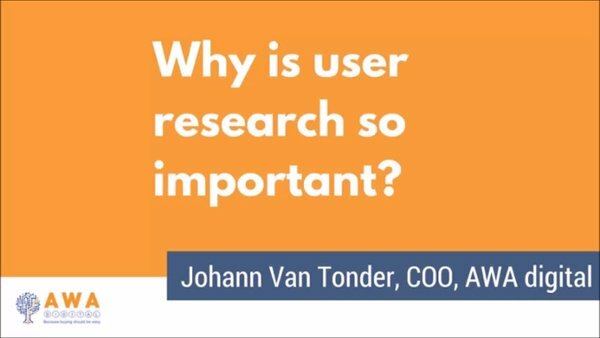 Learn how to exploit user research to grow your online business from this video featuring Johann Van Tonder, AWA's COO. So, you’re not satisfied with your online conversion rate? You do the natural thing, you start tinkering with your website, you make changes to your product details page, your navigational structure, your calls to action. Things that you believe will improve the picture because ultimately your website is a sales tools and therefore if you improve it, you should increase your sales, right? We obsess over conversion rate, which is a binary metric. Has somebody bought? Or haven’t they? And it’s easy to forget what’s behind, not only conversion rate, but all these metrics, the spreadsheets for that matter, the tables and graphs, the things we like looking at. Behind all of this, are people. People and their decisions. Am I going to buy this? Will I buy it from you or your competitor? Will I buy it now or later? Will I wait until you offer me a discount? The route of purchase is not that straight forward, we all know this from experience, it’s convoluted and influenced by a range of factors. And for one, your visitors aren’t always on your website to buy from you. Paco Underhill, in the book ‘Why We Buy’, explains this beautifully. He says, if we only went to the store when we needed to buy something, and then whilst we’re in the store, we only bought what we actually needed at that point in time, the economy would collapse. So, you look at your conversion rate and you wonder what action you can take on your website, but you won’t get very far, until you understand the user and why they’re there at that point in time, what motivates them? And where they are in their decision making process. At the centre of all of this is the purchase decision, that’s what you’re trying to influence, so that’s what you’re trying to and need to understand. More than the “rules” of UX for example, and this is why user research is so crucially important and why it’s the core of our methodology. Things like surveys (which must be the most underrated tool), interviews talking directly to your customers, but also those people that chose not to buy from you. And then ethnographic research, observing people using your products and also the products of your competitors and substitute products. This is because people can’t predict their own behaviour and they also can’t explain really why they bought something. There’s a famous story from Theodore Levitt which is that people don’t buy the quarter-inch drill, they buy the quarter-inch hole in the wall. Do you know your quarter-inch hole in the wall or what that is? Do you know what your customers are actually buying? And is that the same as what you are selling your customers? If you want to make a real difference, this is the level of detail you’ll need to understand, and the way to understand this is by doing user research, and by looking into the psychology behind buying. Don't just focus on metrics, look behind them - at people!